I have posted four of my favorites here, but there are many more on her website www.sarahhaney.com. The true title to this post should be “MJ Misses the Boat…And the Dock…”. 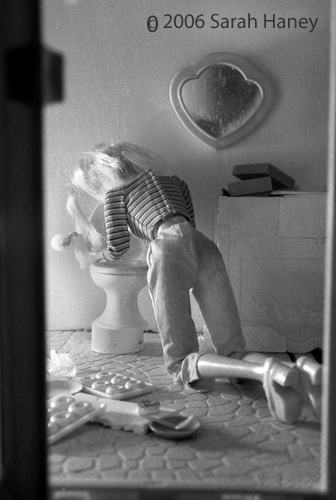 Just last week I scolded Holly because while playing dolls, her storyline took a sinister twist: “Doll A took photos of Doll B in the shower and was blackmailing her”. It didn’t occur to me I should have stopped to take photos for an art exhibit ! Wait, I can go further than that…Many moons ago, while my friends and I took our Barbies through the treacherous terrain of our parent’s gardens, we had to be ever vigilant and guarded against sneak attacks from the neighborhood boys G.I Joe’s. They once captured my Barbie camper for a full week before we were able to A-Team our way into finding it and getting it back. Who knows what Barbie and her gal pals were subjected to at the hands of that “Kung Foo Grip” ! And in my early teens, not quite yet willing to part with my three-story Pepto-pink dream house (with elevator! ), Barbie threw all kinds of parties and nonsense. Not once did any of us think to capture any of it on film. Blah. For the Finale, I saved my personal favorite, “Binge and Purge Barbie”….. Sadly, Ken’s quest for sexual gratification was an exercise in futility sense he was not anatomically correct. Also, I’m pretty sure he likes men. Even if he has never voiced as much, the cardigan tied neatly around his shoulders speaks for itself. And what’s with that hair ! My Barbie was destined to be a bachelorette because I thought Ken was creepy and the neighbor refused to let her date GI Joe. This chick has quite the life eh? I love that binge and purge Barbie has hip bones sticking out. Too funny. I know – this Sarah chick put alot of work into some of her shots! I just found you from you ‘liking’ my blog- thank you! I read one article of yours, then another, and another and another… you are an amazing writer and I’m so glad to have found something so fresh, so original and so much fun to read! You made me giggle more than once, thank you!! Wow, Thanks, you made my week ! Lets make a deal….you keep me from turning into “frump mom” and I’ll keep posting the odd thoughts running through my mind to hopefully entertain and amuse ! I suddenly love Barbie again! I can’t thank you enough for this blog! You are most welcome. Seems Barbie is a bad girl – it’s my contribution to the train wrecks such as the Kardasians or any of the “Housewives”. Thanks, always appreciate a mention, oh Queen of the Queso ! That binge & purge Barbie is fantastic. The framing is perfect! Also, just to let you know – your response to “What question becomes most disturbing when you add a wink?” is one of the finalists! You should definitely begin the shameless solicitation of votes for yourself. & Yea, the barbie photos are as subtly funny as they are an outright laugh.